The mild formulation thoroughly cleanses hair. - Hair is easier to comb. - With an intensive are-Vitamin Complex. Nice, easy to use shampoo that lathers up really well leaving hair soft and clean. Great fruity tropical scent that all kids will love. Even works well on long thick curly hair that tangles easy, making hair more manageable. 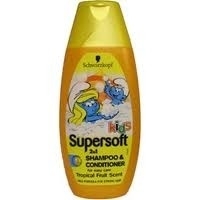 Used on my nieces and left their hair beautiful and soft. Great for short hair too, especially my youngest who has trouble with flyaway hair. This makes washing my little boys hair super easy and fuss free. I love the smell and the fact its kind and mild so no worries of it stinging little eyes.